I was astonished to learn that Jay Jaxon was the first American (and by default, African American) haute couturier. He is not widely known, so it stands to reason that this extraordinary fact about him must be little known, too. So, I found myself surprised, again, when reading up on Patrick Kelly. In the late 80’s Kelly was the first American and person of color to become a member of the exclusive Chambre Syndicale du Prêt-à-Porter. Though Kelly enjoyed a degree of success and recognition during his lifetime, that has endured after his passing, I imagine that this honor felt like a huge validation of his talent and vision as a designer. After all, the world he would eventually inhabit was light years away from his humble, but proud, beginnings. In his working class Mississippi home, Kelly was surrounded by female family members with a flair for making-do and mending. He was introduced to embellishing, reworking and otherwise refashioning from a very early age. It was here that his social consciousness was raised, too. According to reports, Kelly noticed the lack of African American women featured in magazines. His grandmother explained that designers did not think of them when making clothes. This, perhaps, provides some reasoning for the imagery he used in his work. Golliwogs previously had no place in haute couture. Kelly began what would become his life’s work, to clothe ALL women, by starting with his junior high classmates whom he designed and sewed dresses for. Later, Kelly attended Jackson State University where he studied art history and African American history. Eventually driven out by the prejudice and racism he experienced, he left his hometown to pursue a career in fashion. On his own and living in Atlanta, he began to make clothes again. This time, to sell. His work sorting donations at AMVETS (an American veterans’ organization, there) gave him access to a wealth of designer clothing. He refashioned the garments and sold them alongside his original designs. This allowed him to work as a window dresser at the Yves Saint Laurent Rive Gauche Boutique for free. The position gave him a crucial in with the fashion industry elite. His volunteerism paid off. Kelly began to draw a salary at the St Laurent boutique and eventually opened his own selling vintage. In addition to this, he taught classes at a modeling school where Pat Cleveland, a notable person of color in fashion’s history in her own right, encouraged him to go to New York. Taking the advice to heart, Kelly studied design at Parsons in New York City before landing in Paris where he really began to make his mark. 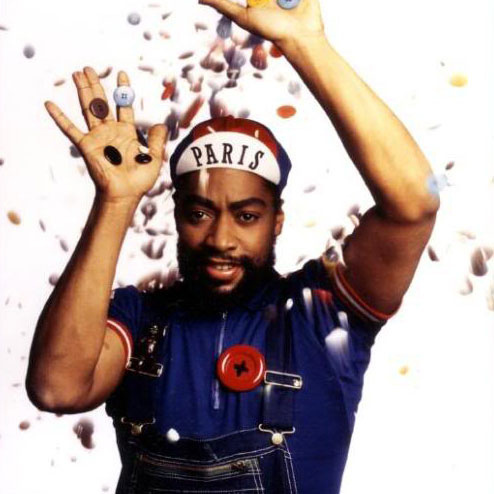 Calling on his combined influences: skills he learned at the feet of his family, showmanship developed while in school, technical skills honed at Parsons and the hustle he displayed when volunteering at the St Laurent boutique, Patrick sold his designs on the streets of Paris. To much acclaim. This is not an easy thing to do. According to Christian Lacroix, “The French function according to love at first sight. If they fall in love with you, they accept you. And Patrick is very lovable. Everybody loves him.” It’s as simple as that. Or is it? Patrick was driven. He took risks. He worked hard. His success did not come from nowhere. Kelly went on to produce unique collections, presented in electrifying (for their time) shows. He remained true to his mission by designing with all women in mind and kept an ear to the street so that his work was reflective of what was in Parisian style. He believed in making affordable clothing, the kind of luxury that women like his mother, aunt and grandmother could have worn in their time. He achieved a level of success that those women, his “full-figured girls”, did not think possible. He had clothes in the finest boutiques, magazine spreads in Elle and so many orders and freelance jobs that he hadn’t vacationed in years. His creations were worn by princesses (like Diana) actresses (like Jane Seymour) and the singers (like Madonna and Grace Jones). It was the all singing, all dancing Patrick Kelly show. But that show would not go on. Kelly’s full and fabulous life was cut short at age 35(ish- he was secretive about his actual year of birth). Though the original cause of death was attributed to bone marrow disease and a brain tumor, it was later confirmed that Kelly was HIV positive and his death was AIDS related. Unlike the houses of other famous designers, Kelly’s folded after his death. One can’t help but wonder what led to this. Kelly had a seemingly vast (and influential) circle of friends. Did legal issues play into the demise of his house? Was there a clash of interests that led its standstill? Are there other, notable designers of color whose work died with them? This article originally appeared at Handmaker’s Factory. There’s a lot more information available about Patrick Kelly than there was about Jay Jaxon. Spend a little time getting to know more about him and he’ll start feeling like a long lost friend!